When it comes to coverage around special events, CNN always draws big ratings, performing especially well among younger news consumers. And that was the case in November 2018. CNN’s coverage surrounding the midterm elections was a major reason why it beat MSNBC in the ever-important A25-54 demographic this month during prime time. Not only did CNN beat MSNBC in the demo across the total calendar week (Monday – Sunday), but it also beat MSNBC in the demo across weekdays, the latter of which it hadn’t done since February 2017. Adults 25-54 is the measurement advertisers have traditionally looked to when deciding whether or not to throw down dollars. 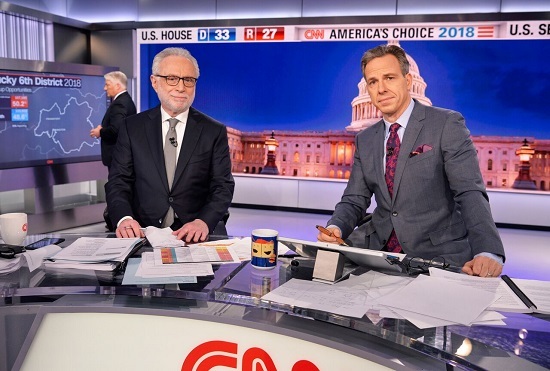 Versus its November 2017 delivery, CNN posted +31 percent growth in total prime time viewers, +10 percent growth in total day viewers, +24 percent growth in the prime time demo, and +1 percent growth among the demo across the 24-hour day. Among all basic cable cable networks, CNN ranked No. 6 in total viewers and A25-54 in total day this month, which marks the 11th straight month that CNN makes the basic cable top 10 among total viewers in total day. Yet while all of those accolades for November are nice, CNN remained stuck in third place in cable news among total viewers. It also remains in third place among the prime time demo for the entire calendar year to-date. On the programming front – The Lead with Jake Tapper ranked No. 1 in the 4 p.m. timeslot among adults 25-54, and posted +8 percent growth in the demo from a year ago. Erin Burnett Outfront beat MSNBC’s Hardball with Chris Matthews in the A25-54 for the sixth straight month. The program has now outpaced MSNBC for nine of the past 12 months. Anderson Cooper 360 surpassed MSNBC’s All in with Chris Hayes for the fifth straight month in the key demo adults 25-54 month, and posted the show’s second-most-watched November on record. Cuomo Prime Time posted CNN’s third-largest 9 p.m. November audience on record, and grew more than the 9 p.m. competition. Maddow was up a bit, while Hannity was actually down year over year in total viewers. Nevertheless, Cuomo remains No. 3 behind the two most popular hosts on cable news. And last but not least, CNN Tonight with Don Lemon grew the most in all of cable news prime time this month. The 10 p.m. hour of Tonight was +34 percent in total viewers and +15 percent in the demo. 10 p.m. competitors Laura Ingraham and Lawrence O’Donnell were slightly down vs. last November. CNN had a very robust prime time ratings performance and tremendous growth this month, with the network easily dominating MSNBC in the key demographic adults 25-54 in November. For the first time since February 2017, CNN beat MSNBC in weekday (M-F) prime time (459k vs. 431k) among adults 25-54. CNN also topped MSNBC in M-Su prime time (395k vs. 360k) in the key demo 25-54, now for the second straight month. CNN grew an impressive +42% in total viewers and +36% among adults 25-54 in weekday prime time vs. last year, while MSNBC is down double digits (-10%) in the key demo. CNN also grew by double digits in M-Su prime time. CNN’s November ratings hit near presidential election year levels, with the network posting its third-highest November M-F prime time audience in 17 years (since 2001) in total viewers (just after 2008 and 2016). The network also registered its third-highest November M-Su prime time since 2001 in total viewers (also following 2008 and 2016). Cuomo Prime Time (9pm) which launched in June, was CNN’s #1 news program in November in total viewers with 1.288 million and in the key demo 25-54 (381k). Cuomo delivered the network’s third-highest 9pm November viewership on record since 2003 in total viewers, and among P25-54 (just after 2008 and 2016). The Cuomo-led program was up the most in cable news at 9pm – increasing +25%, Hannity was down (-10%) and Maddow was up +4% in total viewers. The program also showed the only growth in the demo this month, growing +2%, while Hannity was down -16% and Maddow lost -15% of her audience versus a year ago. CNN Tonight with Don Lemon (10pm) grew the most in all of cable news prime time this month, increasing an impressive +34% in total viewers and +15% in the demo adults 25-54. By comparison Ingraham was down -2%/-7% respectively and MSNBC’s Last Word was down -1%/-24% vs. last year. The Lemon-led program had its second-highest November on record among both total viewers (1.218 million) and adults 25-54 (386k), just behind the 2016 presidential election year. At 11pm, CNN Tonight easily beat MSNBC’s 11th Hour with Brian Williams in the key demo adults 25-54 (324k vs. 276k). The Lemon-led second hour of CNN Tonight grew the most in cable news at 11pm, increasing +25% in total viewers and +17% in the demo adults 25-54 compared to a year ago. MSNBC was down -23% in the demo 25-54 vs. last year.